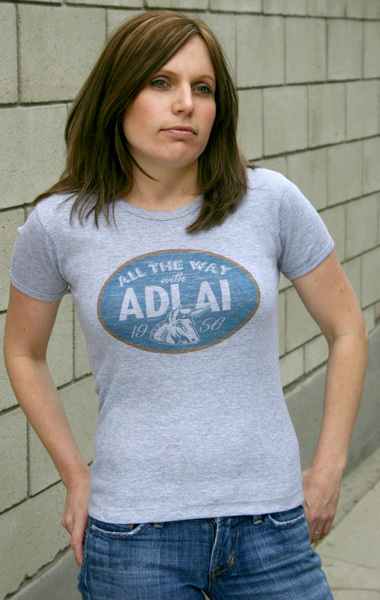 'All the Way with Adlai' was a popular slogan promoting Adlai Stevenson for President during the 1956 presidential campaign. The slogan, along with the iconic Democratic Party donkey symbol, was used on metal lithograph buttons common at that time. We print this design on a thin, heather gray t-shirt, available in unisex and a woman's style. Let's talk sense to the American people! Let's tell them the truth, that there are no gains without pains, that we are now on the eve of great decisions, not easy decisions, like resistance when you're attacked, but a long, patient, costly struggle which alone can assure triumph over the great enemies of man - war, poverty and tyranny - and the assaults upon human dignity which are the most grievous consequences of each. His intellect, eloquent speaking style and debate prowess excited and inspired millions ready to embrace the new America he promoted, but to many others he and his supporters were simply "eggheads." All progress has resulted from people who took unpopular opinions. Twice an unsuccessful candidate for President of the United States ("Never run against a war hero," Stevenson quipped years later about his defeats to General Eisenhower), and later a United States Ambassador to the United Nations during the Kennedy administration, he was always willing to speak his mind on issues important to him, armed with a steady arsenal of wit and wisdom. In America any boy may become President ... and I suppose it's just one of the risks he takes. When questioned whether he thought his support for a ban on nuclear testing might cost him votes, Stevenson remarked: "There are worse things than losing an election; the worst thing is to lose one's convictions and not tell the people the truth." Stevenson also publicly denounced McCarthyism at a time when it was considered politically dangerous (at the very least) to do so. "Because we believe in a free mind, we are also fighting those who, in the name of anti-Communism, would assail the community of freedom itself," he dared to proclaim, in McCarthy's home state of Wisconsin, no less. During his 1952 campaign, a news photographer captured a picture of Stevenson with a large hole in his shoe. "Better a hole in the shoe than a hole in the head!" he remarked. This now iconic political image became a campaign symbol, representing his down-to-earth character and frugality.